"You insult the Starship Frankenstein? How dar you, sir." Inevitably, humanity will crack space travel. Once we do, we'll get to travel the universe and learn all about the planets and their moons from actually being on them. What we'll have to contend with remains to be seen, but there's also a certain inevitability to the fact that we'll have to contend with various lifeforms in space as well. If they're anything like what's encountered in The Disciples #1 from Black Mask Studios, we'll need to be ready to defend ourselves. The issue is written by Steve Niles, illustrated by Christopher Mitten, colored by Jay Fotos and lettered by Thomas Mauer. 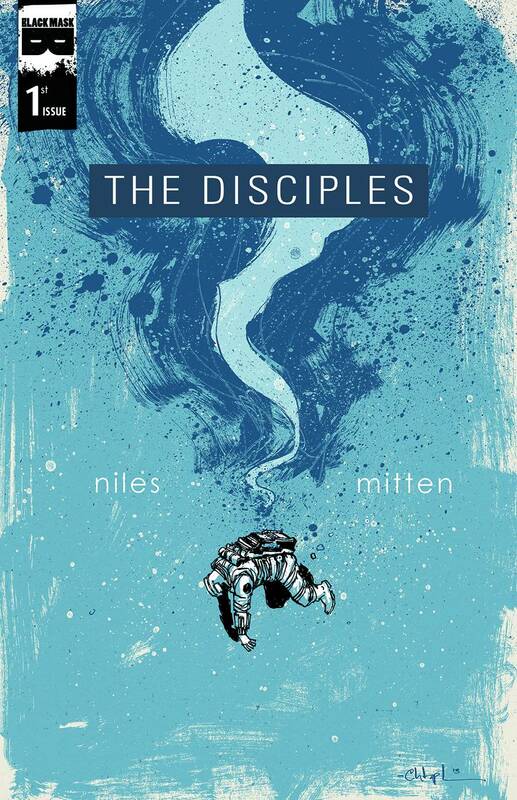 From the outset, it's made abundantly clear that despite the space setting, Niles is pulling no punches in making The Disciples #1 a horror story. Much of the issue feels pretty ho-hum, with Niles presenting the crew as a well-oiled machine used to how things work as they make their way through the galaxy, scraping by. Despite the somewhat mundane aspect of the conversation, Niles ensures that there's a tension bubbling in the background that threatens to spill over into the story itself. What exactly is behind that tension isn't made clear, but that's why it works so well, as Niles draws upon the notion that what's not seen is often more terrifying than what is seen. Niles lays the groundwork for the series rather elegantly in the first issue, refusing to reveal too much for the sake of revealing it. It would be easy to think that with seemingly nothing going on in the issue that the artwork would be equally as mundane, but Mitten ensures that's not the case. His portrayal of the characters relies on loose definitions of said characters, with pretty basic outlines establishing their physiques. While the characters feel very simple, Mitten manages to weave into rather intricate background settings that help liven up the spacecrafts and destinations the crew is visiting. There's an overall jagged finish to Mitten's work that makes the story literally feel sharp and dangerous. Fotos uses a color palette that's awash in blues and greens reminiscent of hues often found in space. The Disciples #1 is an excellent example of starting off a series, as it gives the reader enough to grab onto while promising to offer terrifying plot twists. The crew of Starship Venture are clearly getting in over their head and reading to discover if they can weather the storm they're faced with will be an enjoyable experience. Niles demonstrates extreme patience in the issue, giving the reader subtle clues here and there as to the direction of the story. While the reader can't see much, Mitten's illustrations are solid enough that the reader is confident he'll be able to get into some horrible looking stuff down the road. The Disciples #1 is a fantastic first issue that promises to get even more macabre as it progresses as a series. The Disciples #1 is in stores now.